I am Mother of eternal wealth. Mahalakshmi, or Lady Lakshmi, is a form of Mother Goddess or Shakti. She is popularly known as Sri or Lakshmi. There is a story of the Churning of the Ocean, which tells how the gods worked together to churn the ocean. However t it was 1,000 years before anything rose to the surface. And among them, a beautiful woman standing on a lotus flower – this was Lakshmi, who had returned to the world. With her presence, the gods eventually defeated the demons and chased them out of the world. Whenever Vishnu incarnates on earth in a human form, Lady Lakshmi incarnates along with Him and plays her part in restoring Dharma. When she incarnated as Padma, Vishnu incarnated upon earth as Vamana. She was Dharani when he incarnated as Parasurama, and as Sita when he incarnated as Rama and as Rukmini when he incarnated as Krishna. Lady Lakshmi is the resplendent goddess of wealth and prosperity who provides us with all kinds of material abundance. As a protector as well, she bestows upon deserving people according to their past karma and degrees of devotion, and she also protects from ill health and adversity. Lady Lakshmi and Master Vosloo (when reincarnated as Vishnu) connected to the Temple of Abundance and prosperity, wealth and happiness. Lady Lakshmi and Master Vosloo are twin flames. 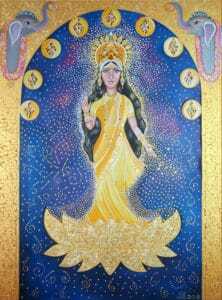 In the painting of Lakshmi she is standing on the Golden Lotus of eternal wealth for humanity, where she has 9 diamond orbs that are activated from the causal Chakra that surrounds her. They spin around her from the 9 dimensions opening for wealth from source to flow through her. She stands in the golden gateway.